Whispers in the Loggia: L'Osservatore "Simply Observes"
For all the firestorm that surrounded its run-up, not until post-Domesday did the Holy See's house organ L'Osservatore Romano venture a comment on President Obama's appearance at Notre Dame... and, indeed, a positive review at that, praising the commencement speaker for seeking "common ground" on abortion and departing from the "strident tone" of the campaign trail. While the "papal paper" likewise ran a piece in Monday's pages to laud the US bishops' recently-launched campaign against the embryonic stem-cell research guidelines released by the pro-choice Democratic administration, the South Bend note -- coming on top of last month's relatively sanguine front-page editorial on Obama's first 100 days (which, it said, "didn't shake the world") -- has garnered downplaying, incredulity or downright scorn from critics on these shores, who've taken to wondering whether the outlet that's been Vatican-owned since 1885 has somehow drifted into schism. Seemingly reflecting the paper's concern over the reaction to its so-dubbed "foolishness" -- calls for the editor's head included -- its lead hand has made a rare extra murem appearance to explain L'Osservatore's line. “What I want to stress is that yesterday, on this precise and very delicate issue, the President said that the approval of the new law on abortion is not a priority of his administration. The fact that he said that is very reassuring to me. It also underlines my own clear belief: Obama is not a pro-abortion [abortista -- "abortionist"] president,” he told Rodari. According to Rodari, "the words of Vian are important. Because they speak about a confrontation between Obama and the Catholic Church which for now seems to be limited mainly [to] part of the American episcopate. A confrontation that the Holy See neither approves nor disapproves. Simply observes." Since his appointment, the editor's largely been given an open tab by his superiors, among other things introducing color and more coverage of culture to the pages, including a November article commemorating the 40th anniversary of the Beatles' "White Album." 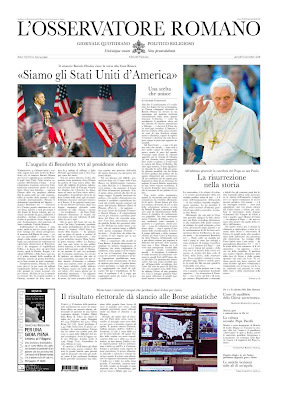 As Vian himself has confirmed in the past, however, Osservatore pieces that touch on international relations must be cleared by the Vatican's Secretariat of State before they can run in print. On a related note, buzz in the circles tips a meeting between the Pope and President for 8 July, prior to the day's opening of the G8 Summit in quake-ravaged L'Aquila.